Some things in life simply have to be experienced to be understood. So it is with lever espresso machines, known for the compelling simplicity of their design and the unique flavor profile of the beverage they produce. The espresso making process of lever machines favors slow, thoughtful movements, an almost Zen-like moment of calm, focused creation. The espresso aficionados that frequent the site's Lever Espresso Machines forum are among the most active members, and yet the objects of their interest have been woefully under-represented among the site's reviews. To address this shortcoming, we organized the Lever Espresso Machines Smackdown, tasked with documenting the unique and noteworthy benefits these traditional machines bring to the barista's repertoire. Sponsored by 1st-line Equipment, this Buyer's Guide focuses on a recent introduction to the US lever espresso machine market, the Ponte Vecchio Lusso. Note: Those wishing to learn how the Lusso compares to other popular lever espresso machines like the Olympia Cremina, La Pavoni Europiccola and Elektra Microcasa a Leva are welcome to read the research notes born out of the Smackdown. Although it was a lengthy discussion, it was never boring! The Lusso is compact and looks tough enough that I would not hesitate to toss it in the back seat with nary a towel around it to protect it from scratches. It's a no-nonsense lever espresso machine. The Lusso's short and wide stance combined with its little rubber feet make it very countertop steady. In terms of aesthetics, it's retro appearance is simple, functional, and very basic. In keeping with the industrial revolution theme, the Lusso comes with non-articulating steam and hot water wands. According to 1st-line Equipment's website, the boiler has a 3 liter capacity. In practice, that's enough to make 10 or so double espressos complete with screen clearing flushes and some steaming before having to refill. So the Lusso is capable of handling a small dinner party. Refilling is accomplished by turning off the machine, venting the boiler pressure through the steam wand, removing the fill cap and pouring water into the boiler through the supplied plastic funnel (needless to say, be careful, it's hot!). The water level within the boiler is visible through a sight glass. It's surprising to have a steam and water tap in such a small package, but as I'll explain later, the water tap turned out to be a big plus. The fittings choices are respectable, the refill cap has a safety hole for those who forget to depressurize the steam boiler, the driptray cover has a flipped up edge that hooks behind the backsplash. Good simple design, but it lacks the polished refinement of more expensive levers. The valves are nylon compression fittings and they will likely go drip drip over time. One significant difference between the Ponte Vecchio Lusso and its more popular cousins is its group design. While all four lever espresso machines in the Smackdown have steam/brew boilers pressurized to approximately 1.0 bar, the Olympia Cremina, La Pavoni Europiccola and Elektra Microcasa a Leva have the grouphead bolted to the boiler. In contrast, the Ponte Vecchio Lusso's grouphead is detached from the boiler and warmed by two thermosyphon tubes going to/from the boiler (photo right). 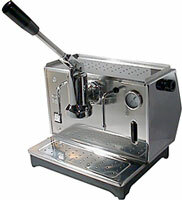 The result is a temperature-stable lever espresso machine, espresso after espresso. On the other hand, having the grouphead in direct contact with the boiler means the machine is ready for brewing more quickly. For example, without any barista intervention, the Microcasa a Leva goes from cold to ready-to-brew in 12 minutes. The Europiccola accomplishes the same feat in only 8 minutes. The Lusso requires more time because the thermosyphon transfers heat more slowly to the grouphead. Once out of the box, I rinsed the boiler several times with water and refilled it until the sight gauge indicated the boiler was three-quarters full. The first extractions dialed in easily, but the espresso's taste clearly said "too hot!" So I removed the top plastic cover under the cup warmer, hoping the pressurestat would be accessible. No dice, the whole body has to come off since the pressurestat is facing the exterior wall with nearly zero clearance. The casing is held on by two bolts from the bottom; I removed the steam knob, water tap knob, two bolts, and slid the casing off once the machine was cool and unplugged, for safety's sake. Once the cover was off and the boiler was back to operating pressure, I adjusted the pressurestat down to 1.1 bar (based on Tim's recommendations in Initial Impressions of the Ponte Vecchio Lusso, whose Lusso was also regulated to the factory setting of 1.5 bar). I have to wonder, what kind of coffee are they pulling at the Ponte Vecchio factory? Heat tolerant Robusta? The espressos were much better at the lower brew temperatures. I used the double basket and a spice jar tamper (more on that later! ), 11 grams of coffee, 4 seconds preinfusion with Fellini Move. The resultant brew ratio is ristretto range 100% with one pull or double range 60% with two. Even though the second pull showed no early signs of blonding, the body suffered. I pull the cup away at the first sign of blonding/translucence. The Lusso's espressos struck me as somewhere between the Olympia Cremina and Elektra Microcasa a Leva. That is, the Lusso's espressos have good flavor, but slightly less clarity and separation than I would expect from the Microcasa. The body is less than the manual lever Cremina, but more than the Microcasa, at least for the ristrettos. My guess is that the Lusso's deeper basket has something to do with it. It's a workhorse lever espresso machine that's easy to use. A competent barista would have no difficulty pulling an acceptable espresso. If using a temperature tolerant blend, the Lusso would shine over HX espresso machines for some operators straight out of the box because it doesn't need a flush to be in the ballpark, whereas HX espresso machine brew temperatures can go all over the map if handled improperly. In other words, "pulling shots by the numbers" by rote instruction for the Lusso is blissfully simple. The Lusso does not come with a properly fitted tamper. They include a stock plastic tamper with one end that can't enter the basket, the other with over 6mm of slack. The low water safety cutoff is an unexpected feature in such an otherwise frills-free machine, but I would trade it for a vacuum breaker. Or even a cheap "low water" indicator and a vacuum breaker. The low water safety cutoff acts in the event you run the boiler too low on water, while an inexpensive vacuum breaker would eliminate the nuisance of bleeding off false pressure every day. On the other hand, new espresso machine owners may be saved by the low water safety cutoff. In the spirit of full disclosure, it even saved me once when my youngest son the "budding toddler barista" decided to flip the switch on one morning, not understanding that I had drained the boiler the previous day. Its driptray is ineffective, not only in volume, but the holes are spaced so far apart that water collects there rather than reaching the collection tray below. Fortunately there's very little need for a driptray since I use a 12 ounce pitcher for cleanup. As fate would have it, the grouphead fits nicely in the pitcher with just a little margin, so I can blast crud off the screen by enclosing the bottom of the grouphead with the pitcher and pulling the lever down. It splashes enough in the pitcher to wash down the screen and the gasket. The steam and water tap valves seem old-fashioned. They work fine, but the valve bodies are brazed directly into the boiler. Rebuilding the valves looks possible and reasonable, but it'll be costly if a valve body requires replacement for any reason. 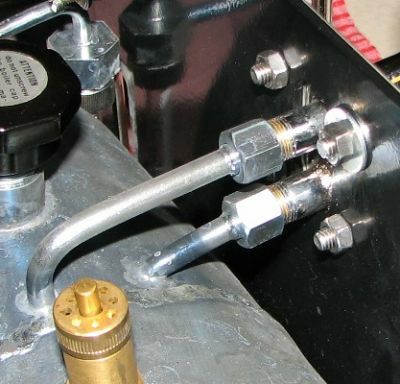 Descaling a valve will also be more work than would be the case if the valves were completely demountable as you can't just throw the valve in a bucket of descaler. The included knobs are small, rounded, and knurled; star-shaped handles would look better and they'd offer a better grip. On the positive operational side of the ledger, the Lusso is fast to clean up. Temperature wise, it's much easier to manage than your typical lever. The Lusso also allows a significant margin of error in barista technique. Overall, it's a surprisingly newbie-friendly package.